We listened to your feedback and have added some more features to the first version. 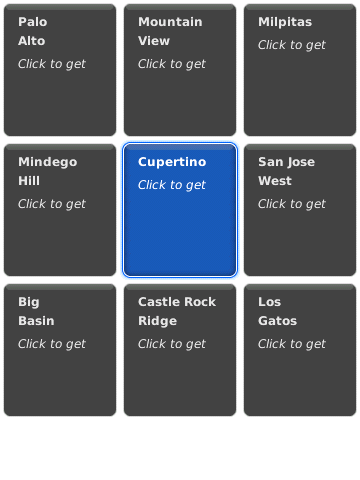 TopoSports has been enhanced with the ability to find nearby quads and download them. "MyLocation" keeps showing you in an area for which you do not have a map. Simply press menu and select "Nearby quads". This will show you all the nearby quads in a grid. The quad for the map you are looking at would be the center of this grid. You already have quad of an area and you want to look at its neighboring quads. 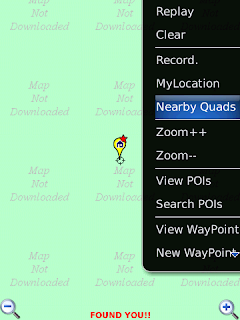 Simply select the quad you have download, press menu and select "Nearby quads". I am including below screenshots of this in action. The screenshots were taken on a Storm1. More convenient hotkeys: Pressing 'i' on devices with full 'qwerty' keyboard should now zoom-in. This will make it more consistent with RIM's built in apps which use 'i' for zoom in and 'o' for zoomout. If you have a blackberry pearl 'l' will continue to zoom-in. Minor messaging changes during map download.